Vertebrate Endocrinology represents more than just a treatment of the endocrine system-it integrates hormones with other chemical bioregulatory agents not classically included with the endocrine system. 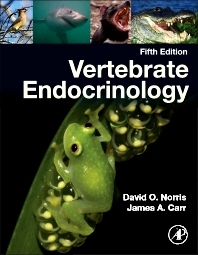 It provides a complete overview of the endocrine system of vertebrates by first emphasizing the mammalian system as the basis of most terminology and understanding of endocrine mechanisms and then applies that to non-mammals. The serious reader will gain both an understanding of the intricate relationships among all of the body systems and their regulation by hormones and other bioregulators, but also a sense of their development through evolutionary time as well as the roles of hormones at different stages of an animal's life cycle. V. Aldosterone: The Principal Mammalian ""Mineralocorticoid""
Dr. David Norris has done research in environmental endocrinology and neuroendocrinology for more than 50 years. Dr. Norris is a Professor Emeritus in the Department of Integrative Physiology at the University of Colorado. He received his bachelor’s degree from Baldwin-Wallace College and his Ph.D. in 1966 from the University of Washington. Dr. Norris has worked in the area of forensic botany with Dr. Jane H. Bock, since 1982, primarily on developing the use of plant cells in the gastrointestinal tract to aid in homicide investigations. Dr. Norris and Dr. Bock have been involved in investigations in numerous states as well as throughout the State of Colorado. Dr. Norris has been certified as an expert witness in this area for the State of Colorado. With Dr. Bock, Dr. Norris also has consulted on other botanical evidence for criminal investigations. He was elected a Fellow of the American Academy of Forensic Sciences in 2014. Dr. James A. Carr is a Professor of Biology in the Department of Biological Sciences at Texas Tech University. His research has focused on various aspects of environmental endocrinology and neuroendocrinology for 25 years including the effects of opioid peptides on brainstem, cardiovascular areas and pituitary hormone secretion, the impact of environmental pollutants on the thyroid and reproductive axes in fishes and amphibians, and the impact of stress hormones on subcortical visual pathways involved in feeding.